Arthritis can affect any one of the small joints of the hand and fingers. Sometimes, the patient adjusts to it. But at times, arthritis can significantly interfere with daily activities such buttoning a shirt, turning a key, writing, or typing. It may interfere with leisure activities such as knitting, sewing, painting and using manual tools. 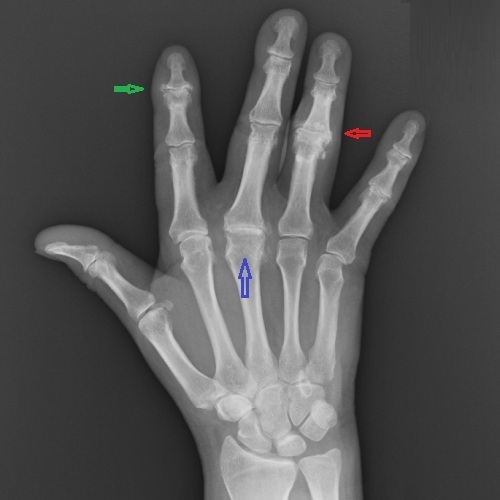 Usually, arthritis is obvious on x-rays. Sometimes, it is not so obvious, especially in the early stages but may be suspected based on the situation. Early symptoms of arthritis of the hand include pain or burning sensation over the involved joint. The pain usually occurs or increases after heavy use, such as repetitive and heavy gripping or grasping as well as when using fine or manual tools. A classic example is pain when opening a jar. With time, the affected joint becomes stiff, and you may lose the ability to make a full fist. You may also show knots over the joint, which show as spurs on x-rays. The fingers may become less well aligned. When arthritis affects the end joints of the fingers, you may develop a cyst on top. Treatment for hand arthritis depends on how painful or dysfunctional the hand is, and what the goal of treatment is. There are several options available including medication, splinting, injections, and surgery. Medications Medications treat symptoms but cannot reverse the damage. The most common medications for arthritis are anti-inflammatories and acetaminophen. They may provide enough ain relief as long as you are able to use your hands effectively. Injections are also useful. Again, they do not reverse the problem but may buy you enough time and provide enough relief. I find injections very effective for arthritis of the base of the thumb. Splinting splints help support the affected joint and work by limiting its motion to lessen the irritation and pain. They can be cumbersome and may defeat the purpose as thy do not allow to use the affected joint and may be more in the way. A thumb splint or brace can be very effective for pain and I usually recommend it together with an injections for patients who have less demands or do not have persistent and worsening symptoms. For the other fingers, I am not a big fan of splints. Surgery When all else fails, surgery can be effective. There are two types of surgery, and each carries its own price tag. If you are willing to sacrifice the motion in that joint in return for a durable and long-lasting surgery, you may prefer a fusion. A fused joint does not move, and may be cumbersome and less appealing. It also requires that the bones to heal like a fracture would, and there is always a chance they may not ( a nonunion). I favor a fusion for the distal-most of the three joints of the fingers and sometimes for the base of the thumb. If motion is not something you are willing to sacrifice, then a joint replacement may be a good option. This involves taking down the damages surfaces and replacing then with metal and or plastic, the same way artificial knees and hips are done. The downside is that they may not be as durable and you may have to be careful not to wear them down too soon. I favor replacement for the first and the middle joints of the fingers. In case of arthritis of the thumb, it is a different story.